Bear-market panic forgets bull markets always follow -- often faster than expected. 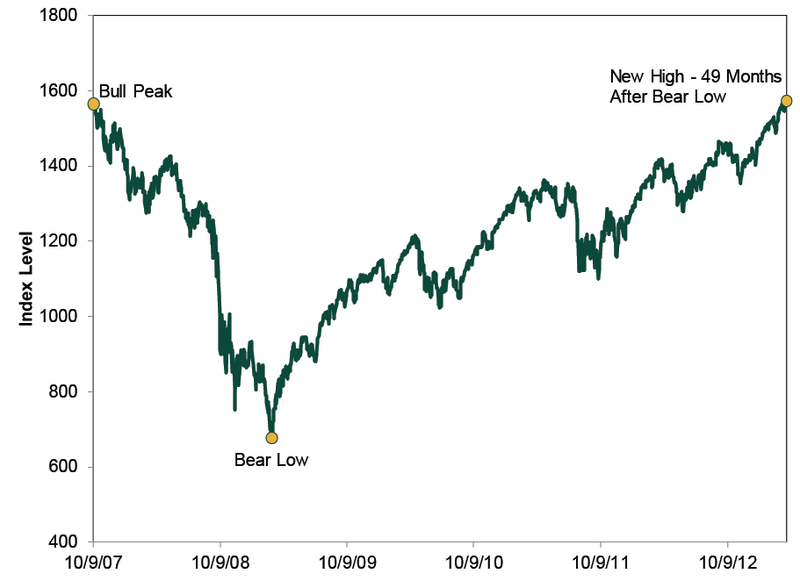 On October 9, 2007, markets hit their zenith, ushering in one of the worst bears in history. The peak passed unnoticed, as most do -- not least because peaks are only knowable in hindsight. But at first, there wasn't much worth noting -- stocks fell, but slowly and incrementally. The consequences of banks' having to value illiquid securities on their books at fire-sale prices -- whatever new low the most recent fire sale set -- didn't manifest until about a year later. At that point, the Federal Reserve and Treasury Department exacerbated the crisis and the panic through their haphazard, ill-targeted responses. Panic spread, particularly in the fall of 2008 and winter of 2009. 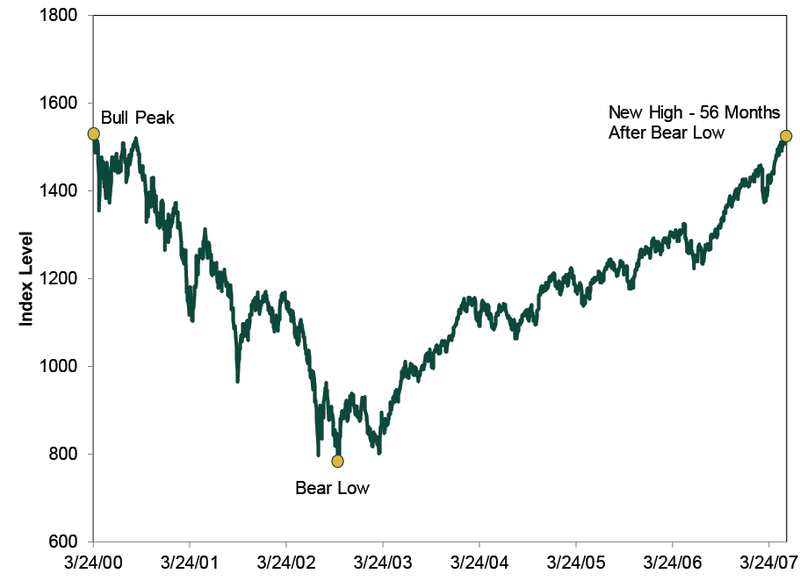 From the peak to the March 9, 2009 trough, the S&P 500 Index fell 55.3%. [i] In the darkest days, some felt like stocks would never rise again. Many feared their investment goals were finished. Yet just over 10 years later, stocks have erased the decline and then some. 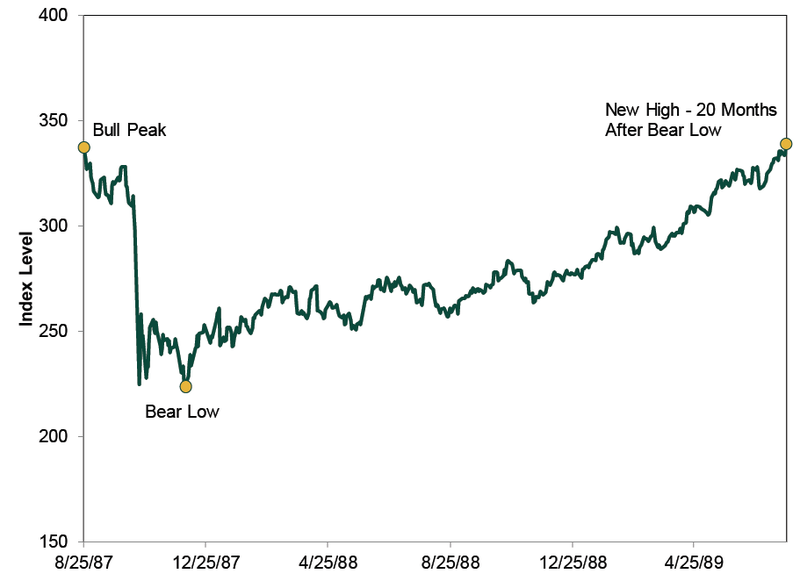 While that doesn't make the memories of the bear any less painful, it does highlight a key lesson: If you have a long time horizon, staying invested through bear markets shouldn't put your long-term goals out of reach. This was hard for many to grasp during the bear's depths. Since the last true financial panic occurred in 1930 during the Great Depression, most U.S. investors in 2008 had never experienced one. Just over 10 years on, it might be hard to grasp what sentiment was like -- emotional scar tissue can blunt memories. But it was wild. Stocks would swing down big one day, then bounce high the next as speculators scrambled to cover short positions -- and then tank again on day three. The volatility was gut-wrenching, and it seemed like anything -- or nothing -- could trigger it. Some folks worried the entire stock market could go to zero. Investors fled en masse, desperate to exchange stocks for anything that seemed less susceptible to the madness -- cash, bonds, gold, annuities, you name it. Yet while this might have felt better immediately, it overlooked a simple truth: Bull markets follow bear markets. It's often darkest just before the dawn. In our view, losing sight of this can be dangerous. Depending on an investor's time horizon and cash-flow needs, participating in a bear isn't necessarily devastating. However, abandoning stocks after participating in a bear's deep declines locks in losses, and it raises the risk stocks snap back before you get back in. In the industry vernacular, you could get whipsawed. Participating in bear markets needn't be a permanent setback, provided you also participate in bull markets. This is also hard for many to fathom: When this bull market began in 2009, many feared a "new normal" of below-average stock returns. Since it takes a higher percentage gain to offset a given loss, a "new normal" recovery raised the specter of going decades without recouping losses. Even if you didn't buy the "new normal" idea and were considering only stocks' average annualized return (around 10% since 1926),[ii] you might still have expected to take a decade or more to recover fully. But average returns include all bear markets, and most of the time, stocks' actual annual returns are more extreme than the long-term average. Gains often come in clumpy patches -- and since bear markets usually end with a V-shaped rebound, some of the biggest clumps can occur early in a bull, speeding the time to recovery and surprising many. For instance, from the March 9, 2009, trough through yearend, the S&P 500 gained 68%. [iii] Other recoveries have bounced fast and high, too -- with new market records coming a within a few years, sometimes months. Source: FactSet, as of 10/6/2017. S&P 500 daily price returns, 8/25/1987 - 7/26/1989. Price returns used in lieu of total due to data availability. Source: FactSet, as of 10/6/2017. S&P 500 daily price returns, 7/16/1990 - 2/13/1991. Source: FactSet, as of 10/6/2017. S&P 500 daily price returns, 10/9/2007 - 3/28/2013. This is why we believe the time to act is early in a bear -- or not at all. Signs of an early-stage bear -- a major, long market decline of 20% or greater --include cresting euphoria that ignores deteriorating fundamentals, or an unseen, multitrillion-dollar negative suddenly walloping the global economy and stocks. Because these drivers are fundamental, we think they're possible to spot, making it possible to avoid a chunk of the decline if you identify a bear early enough. (Not so with corrections -- shorter, sharper, 10%-20% declines that come and go without warning.) We don't think it's required if you're investing for long-term growth, but it can help. But the key is identifying a bear market shortly after it forms. After stocks have endured significant declines, we generally think the risks of getting out outweigh the risks of staying in. Now, this doesn't mean there is a cookie-cutter approach for all investors. What is right for you always depends on your unique circumstances, time horizon, cash flow needs and goals. But for investors whose time horizons are sufficiently long and who don't have high cash-flow needs, experiencing bear markets doesn't have to be a permanent setback. 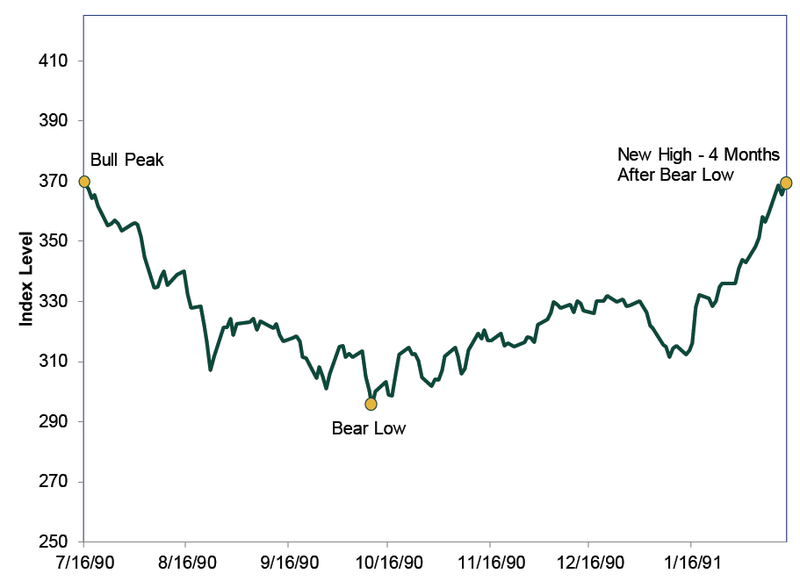 Bull markets follow bears, and they have historically outweighed bear markets in length and magnitude. Bears loom large in memory because they're so emotionally painful, but they don't loom so large in stocks' long-term returns. [i] Source: FactSet, as of 10/6/2017. S&P 500 Total Return Index, 10/9/2007 - 3/9/2009. [ii] Source: Global Financial Data, Inc., as of 10/6/2017. S&P 500 Total Return Index, 1926 - 2016. [iii] Source: FactSet, as of 10/6/2017. S&P Total Return Index, 3/9/2009 - 12/31/2009.